•Green and red LED pair. •Green and yellow LED pair. •LED bar comprising five yellow LEDs. These LEDs are controlled by the SG and SR pins of the EM1000. Further information on status LEDs can be found in Status LEDs. These LEDs are connected to the same EG and EY lines of the EM1000 that control green and yellow LEDs on the NB1000 board itself. These LEDs are controlled through three GPIO lines of the EM1000- GPIO46, GPIO47, and GPIO48. GPIO46 is the reset line of the LED bar. Clearing this line sets all five outputs to LOW and this turns all LEDs ON. GPIO47 is a clock line- a positive (LOW-to-HIGH) transition on this line "shifts in" the data on the GPIO48 line. 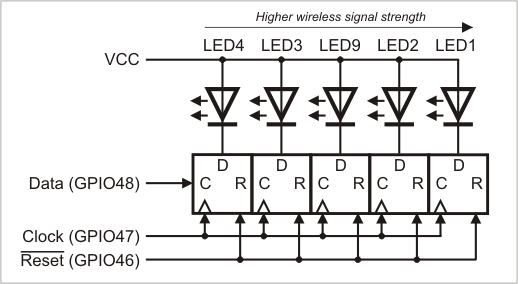 The circuit that controls the LEDs is shown below. LED numbers correspond to numbers shown on the LB100x drawing. •GPIO 48 is the Data line; set it to the state that you wish the LED to be in, LOW = ON, HIGH = OFF. •When you then pull GPIO 47 (Clock line) from its normal state (HIGH) to LOW and then back to HIGH, the state of the Data line is read in and used for LED1. •If you want to turn on LED2 (for example) you have to set GPIO 48 to LOW, toggle the clock once (HIGH-LOW-HIGH) which would set LED1 ON, set GPIO48 to HIGH (because you want LED1 off) and then just toggle the clock again (HIGH-LOW-HIGH). At this point, the state of LED1 would shift to LED2 (so LED2 would light up). As you can see, each clock cycle sets a new state for LED1 which directly corresponds to the state of the Data line, and shifts all previous LED states.